Claimer.org: Can Human Rights serve as a legal basis for climate change compensation claims? Can Human Rights serve as a legal basis for climate change compensation claims? Can climate change litigation be based on Human Rights? Human Rights could be referred to if states fail to protect against climate change and its effects. In some jurisdictions, Human Rights cannot be referred to in public or private law at all. In others, Human Rights constitute only defensive rights of the individual against action of the state. In a few jurisdictions, Human Rights oblige the state to protect the rights holders – and failure to protect can trigger compensation. States of this type are interesting for climate change compensation lawsuits. They are interesting not only for residents of this state, but also for victims of climate change abroad, see the section “IX. Extraterritorial dimensions of human rights and the environment” of the Annex. Finally, in very few jurisdictions, Human Rights can even influence the legal relationship between private persons. In these states, Human Rights might thus even influence a compensation lawsuit between private natural or legal persons. One way how Human Rights can find their way into civil law is that they constitute a right encompassed by a liability provision. For instance, in several continental European law systems defendants are liable if they infringed a certain right in an unlawful way. Human Rights could be rights in the meaning of such provisions. In order to use the possibilities offered in some jurisdictions, the link between climate change and Human Rights must be established. The article “Restoring the Climate by Realizing Rights: The Role of the International Human Rights System” of Edward Cameron and Marc Limon which appeared in November 2012 in the Review of European Community & International Environmental Law (Volume 21, Issue 3, pages 204–219) provides a good starting point for the investigation of such a link. The authors show how the effects of climate change are more and more often looked at under Human Rights aspects. The link between climate change and Human Rights is already strongly demonstrated in soft-law documents. 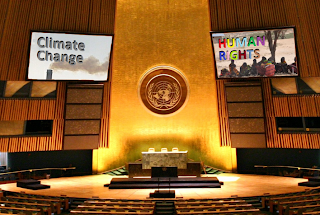 E.g., on 28 March 2008, the Human Rights Council Resolution 7/23 on ‘human rights and climate change’ established a link between climate change and human rights. Since then, the issue is under investigation by the Office of the High Commissioner for Human Rights (OHCHR). A recent report the OHCHR office examines, amongst other legal aspects, the “extraterritorial dimensions of the human rights and environment interface”. If there was such an extraterritorial dimension of the human rights, governments might get sued for inactivity not only by persons on their territory, but also from abroad. The authors refer also to the so-called “Special Procedures” which aim at addressing specific Human Rights issues falling outside the ordinary mechanisms, mainly by nominating “Special Rapporteurs”. And these “Special Procedures” came already to specific results: “Special Procedures issued a joint statement entitled ‘An ambitious climate change agreement must protect [the] human rights of all’, in which they argued that a weak outcome from COP-15 would threaten to infringe on human rights and called on mitigation and adaptation policies to be developed in accordance with human rights norms.” The new “Special Procedure on human rights and the environment” brings along even more possibilities for building a legal consensus, say the authors. 25. Certain international human rights instruments concluded after the 1972 United Nations Conference on the Human Environment explicitly recognized the linkage between human rights and the environment. For example, the Convention on the Rights of the Child refers to the environment plainly: article 24, paragraph 2 (c), requires States to pursue the full realization of the right of the child to the enjoyment of the highest attainable standard of health taking into consideration the dangers and risks of environmental pollution. Regional human rights instruments such as the African Charter on Human and Peoples’ Rights and the Additional Protocol to the American Convention on Human Rights in the Area of Economic, Social and Cultural Rights make explicit references to the environment. Older human rights instruments that were adopted before the linkage between human rights and the environment emerged do not explicitly refer to the environment. However, as detailed in subsequent sections, the human rights treaty bodies and regional human rights mechanisms have interpreted their respective human rights instruments in a manner that recognizes the environmental dimensions of protected rights. In this regard, older human rights instruments recognize the linkage between human rights and the environment by implication, such as in relation to the environmental dimensions of the rights to life, food, health, housing, property and private and family life, among others. Procedural human rights and cross-cutting components of the human rights-based approach – such as the right to participation in political life, the right of specific groups to be consulted in decision-making processes, access to justice, due process, access, transparency and accountability – are also relevant for environmental decision-making. Similarly, the examination of many environmental instruments shows that they articulate their objectives with regard to the protection of public health and the environment, incorporate notions of common heritage of mankind and recognize environmental protection as an essential component for human survival and development. In addition, several environmental instruments also proclaim explicitly the importance of access to information, public participation and access to justice in environmental matters, which are crucial guarantees for democracy and the rule of law. 28. The examination of human rights and environmental instruments leads to the conclusion that human rights and the environment are explicitly and implicitly interrelated. The growing awareness of this interrelationship makes an important contribution to the enjoyment of human rights and a healthy environment. Certain aspects of the linkage are, however, in need of strengthening and further clarity, in order to more effectively promote human rights and a healthy environment. For example, greater elucidation is needed as to how to apply a rights-based approach to the negotiation and implementation of multilateral environmental agreements. The jurisprudence on environmental issues that has emerged from the African, European and Inter-American human rights systems has contributed to clarifying how environmental degradation affects human rights. This section explores the case law of three regional human rights mechanisms, namely the African, Inter-American and European systems. 33. These three regional human rights systems have addressed cases involving environmental issues and developed jurisprudence linking human rights and the environment. These bodies of law have identified how environmental issues relate to the rights protected under the relevant regional human rights instruments. In their jurisdictional exercise in response to individual and collective complaints, the regional systems have clarified the environmental dimensions of a number of protected rights, such as the right to life, the right to health, the right to private and family life, the right to property and the right to development. 34. The African Commission on Human and Peoples’ Rights has especially focused on the rights of indigenous and tribal peoples affected by environmental degradation resulting from extraction activities and their forceful removal from their traditional lands.1 The African Commission has detailed the importance of the right to a healthy environment recognized in the African Charter on Human and Peoples’ Rights, underscoring the role of carrying out environmental impact and independent scientific assessments prior to such activities. The African Commission has also given details on the right to benefit from natural resources and the right to development, articulating important standards regarding informed consultations and free and prior informed consent. The Inter-American Court of Human Rights has contributed to establishing important standards of protection for indigenous and tribal peoples in relation to the environment. The Court has recognized that indigenous and tribal peoples have a right to property over the lands and territories that they have traditionally occupied.2 To reach this conclusion, the Court interpreted the American Convention of Human Rights in the light of other relevant international human rights treaties. For example, the right to the ancestral lands, territories and natural resources has been supported by the right to self-determination recognized in both the International Covenant on Civil and Political Rights and the International Covenant on Economic Social and Cultural Rights, and by the standards set by International Labour Organization Convention No. 169 (1989) concerning Indigenous and Tribal Peoples in Independent Countries. The Inter-American Court has also developed a system of safeguards that apply where the State is considering approving development or investment projects that may impair the enjoyment of the rights of indigenous peoples. In such cases, in order to safeguard the survival of the peoples concerned, the State is required to: conduct independent environmental and social assessments; ensure adequate benefit-sharing schemes; and conduct effective and culturally appropriate consultations, as well as obtaining free and prior informed consent in certain cases. These safeguards doubtless contribute to clarifying the linkage between human rights and the environment. At the same time, further guidance is needed to implement these safeguards. The European Court of Human Rights has also contributed to elucidating the human rights and environmental relationship, particularly in cases involving environmental pollution. The Court has found that environmental pollution can interfere with the enjoyment of several protected rights, particularly the right to life and the right to private and family life. The Court has also established that the State has positive duties to protect individuals from environmental risks. This body of law has clarified State responsibilities to address environmental risks once they become known, including through appropriate and effective regulation, monitoring and enforcement, and State duties to disclose information to the public regarding environmental risks. 40. In summary, the African, Inter-American and European human rights systems have contributed to elucidating the environmental dimensions of rights protected under the relevant human rights instruments. The adjudication of cases involving forced displacement, environmental pollution or unsustainable extraction of natural resources has led to the designation of a growing body of State responsibilities regarding decision-making processes relating to environmental policy and the protection of persons and communities affected by environmental risk. 55. In summary, human rights charter-based bodies have considered in various ways the relationship between human rights and the environment, including the various resolutions they have adopted and the mandates established under special procedures. Much effort has gone into identifying linkages between human rights and environment and the outcomes of such efforts provide valuable guidance to States and other actors. However, part of this material is dispersed and there is a need for consolidation. Similarly, a focal point on environment and human rights could provide valuable input to the various procedures addressing the environmental dimensions of their respective mandates. 63. In summary, both the Committee on Economic, Social and Cultural Rights and the Human Rights Committee have strongly contributed to clarifying aspects of the environmental dimension of human rights. Nevertheless, new aspects of this relationship require further work, such as the climate change and human rights interface. The extraterritorial dimensions of the human rights and environment interface provide fertile ground for further inquiry, particularly in relation to transboundary and global environmental issues. The linkage between human rights and the environment raises the question whether human rights law recognizes States’ extraterritorial obligations. The present chapter illustrates the most important issues relating to States’ extraterritorial obligations, in regard to environmental issues and explores the contours of human rights law as it evolves toward recognition of the extraterritorial obligations of States. The extraterritorial dimension of the human rights and the environment linkage is evident in the area of transboundary environmental harm. Such harm arises where environmental degradation results in the impairment of rights of people outside of the territory of the State where the damaging activity occurs. One country’s pollution can become another country’s environmental and human rights problem, particularly where the polluting media, like air and water, are capable of easily crossing boundaries. The extraterritorial problem raised by transboundary environmental harm also extends to global pollution issues, such as the concentration of greenhouse gases in the atmosphere leading to dangerous climate change and marine dumping, which may affect areas beyond national jurisdiction such as the high seas. Additionally, extraterritorial concerns may arise where States fail to adequately regulate transnational corporations and other business entities, incorporated or otherwise, having substantial business operations in their territories which cause environmental harm in the countries where they operate. Often, environmental harm resulting from the activities of transnational corporations occurs in developing countries lacking effective means of monitoring and enforcing compliance with environmental laws and regulations. Failure by a State to regulate, by action and omission, indirectly causes environmental degradation beyond its territory. Important progress has been made towards the recognition of the extraterritorial obligations of States in human rights law, particularly in the area of economic, social and cultural rights. This progress is particularly important where human rights obligations are related to environmental degradation. Perhaps the key question with regard to the extraterritorial dimension of human rights and environment is the spatial scope of application of human rights law instruments. The universality of human rights proclaimed in the Universal Declaration of Human Rights has inspired the development of a number of legally binding treaties codifying State obligations to protected rights. Such international human rights law instruments have varying approaches to jurisdictional limitations on the spatial scope of application and extraterritorial reach of States’ obligations. Some human rights treaties contain provisions that specify jurisdictional limitations on States’ obligations. For example, the International Covenant on Civil and Political Rights, the European Convention for the Protection of Human Rights and Fundamental Freedoms and the American Convention on Human Rights contain jurisdictional limitations formulated differently. On the other hand, a number of international human rights instruments do not incorporate jurisdictional limitations on their spatial scope of application. The International Covenant on Economic, Social and Cultural Rights, the African Charter on Human and Peoples’ Rights, and the American Declaration of the Rights and Duties of Man contain no provisions specifying jurisdictional limitations on State’s obligations. Moreover, elements of extraterritorial obligations in the field of economic, social and cultural rights – and children’s rights and the rights of persons with disabilities – can also grounded in obligations to perform international cooperation and assistance that are explicitly recognized in the respective international human rights instruments. Another important question that arises in relation to the extraterritorial dimension of human rights and environment is the extent to which international environmental law principles can inform the application of human rights instruments. The duty to prevent transboundary environmental harm, for example, is widely recognized as an element of customary law. In its case law, the European Court of Human Rights has resorted to this principle where environmental damage has crossed boundaries. An indication of the increasing attention paid to extraterritorial obligations is the adoption in September 2011 by a consortium comprising academic institutions, non-governmental organizations and human rights experts – including some special procedure mandate holders – of the Maastricht principles on extraterritorial obligations of States in the area of economic, social and cultural rights at a conference that took place in Maastricht, Netherlands. The principles detail the status of the extraterritorial dimension of human rights law in the area of economic, social and cultural rights, while at the same time contributing to the progressive development of that dimension. Lastly, the recognition of the extraterritorial obligations of States allows victims of transboundary environmental degradation, including damage to the global commons such as the atmosphere and dangerous climate change, to have access to remedies. Those who are adversely affected by environmental degradation must be able to exercise their rights, irrespective of whether the cause of environmental harm originates in their own State or beyond its boundaries and whether the cause of environmental harm lies in the activities of States or transnational corporations. 73. In summary, there have been important efforts to clarify States’ human rights extraterritorial obligations, including with respect to environmental degradation. The evolution of human rights law in this area has been influenced by principles and tools employed in the environmental protection regime. However, further guidance is needed to inform options for further development of the law in this area. Since the United Nations Conference on the Human Environment held in Stockholm in 1972, the relationship between human rights and the environment has received increased attention from States, international institutions and civil society. The Human Rights Council has observed that sustainable development and the protection of the environment can contribute to human well-being and the enjoyment of human rights. Several human rights instruments concluded since the Stockholm Conference have included explicit references to the environment or recognized a right to a healthy environment. Similarly, numerous environmental instruments explicitly articulate their objectives in terms of protection of human health, the environment, and the common heritage of humankind. In addition, a significant number of States have incorporated environmental rights and responsibilities into their national constitutions. 76. The Human Rights Council has also observed that environmental damage can have negative implications, both direct and indirect, for the effective enjoyment of human rights. In this connection, the human rights treaty bodies have addressed the environmental dimensions of the rights protected under their respective treaties, for example, in general comments, decisions concerning individual petitions and concluding observations. Similarly, regional human rights monitoring bodies and courts have clarified the environmental dimensions of protected rights, including the rights to life, health, property, private and family life and access to information. 77. Furthermore, the Human Rights Council has noted that human rights obligations and commitments have the potential to inform and strengthen international, regional and national policy making in the area of environmental protection, promoting policy coherence, legitimacy and sustainable outcomes. In this regard, over the last three decades, human rights mechanisms have contributed to clarifying the linkages between human rights and the environment. The United Nations human rights charter-based bodies in particular have contributed to elucidating certain elements of the linkage between human rights and the environment through the adoption of resolutions that provide guidance to States and international organizations. In addition, several special procedures established by the former Commission on Human Rights, the former Sub-Commission on Prevention of Discrimination and Protection of Minorities and the Human Rights Council, for example, concerning environment, toxic materilas and toxins, food, water, housing, extreme poverty and indigenous peoples, have contributed to clarifying and strengthening the human rights and environment linkage. 78. While much progress has been made in elucidating the complex and multifaceted relationship between human rights and environment, the dialogue between the two fields of law and policy has still left a number of questions open. The theoretical discussions on the relationship between human rights and environment raise salient questions concerning, inter alia, the need for and the potential content of a right to a healthy environment; the role and duties of private actors with respect to human rights and the environment; and the extraterritorial reach of human rights and environment. Similarly, such questions arise regarding the operationalization of international human rights obligations as how to implement a rights-based approach to the negotiation and implementation of multilateral environmental agreements; and how to monitor the implementation of human rights treaties which recognize the right to a healthy environment or interconnected rights. These questions and other pending challenges lead to the following recommendations. 79. The Human Rights Council may consider paying special attention to the relationship between human rights and the environment through the appropriate mechanisms. These may include, inter alia, the establishment of a special procedure on human rights and the environment, the organization of a high-level panel or a call for further or more specific studies on the issues at hand. More focused attention on human rights and the environment would provide the Human Rights Council with detailed analysis of the key issues and gaps that arise in the relationship between human rights and environment. This analysis and information generally is key to enable the Human Rights Council to provide guidance to the international community in regard to the pressing human rights challenges facing humanity in the twenty-first century, including the recognition of a general right to a healthy environment. 80. The mechanism chosen by the Human Rights Council could also serve to further strengthen and clarify the relationship between human rights and the environment, and to systematize the work of special procedures, treaty bodies and regional human rights courts and monitoring bodies on the issue. In addition, it could provide guidance to the implementation of principles relating to the extraterritorial obligations of States, particularly in the area of environmental protection.